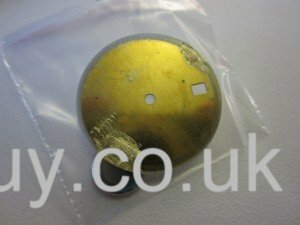 The machine arrived, and I did some trials on an old dial, and wasn’t happy enough. With a couple of emails to Peter from watchlume.com, who sells the machine, we got things sorted, and he changed the design a bit, and I was very happy with the result. Having taken the feet that don’t fit the movement off, I now have to find the exact position for the new feet on the dial – not easy. 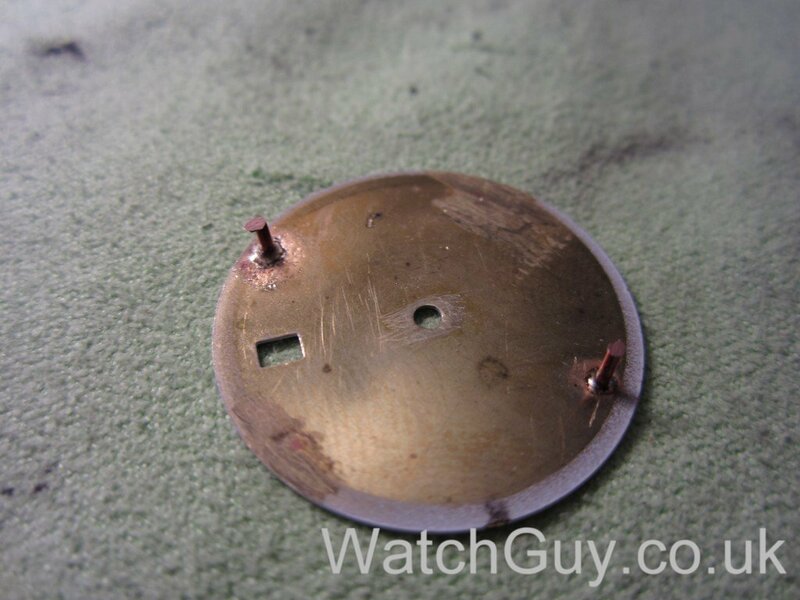 I start off by putting bits of copper wire that have the right diameter (here 0.7mm) into the dial feet holes of the movement. To be able to mark the position, I put some blue grease (Moebius) on top of the wire, as you can see in the photo. You can see how the grease leaves a very distinct blue dot where the dial foot has to go. 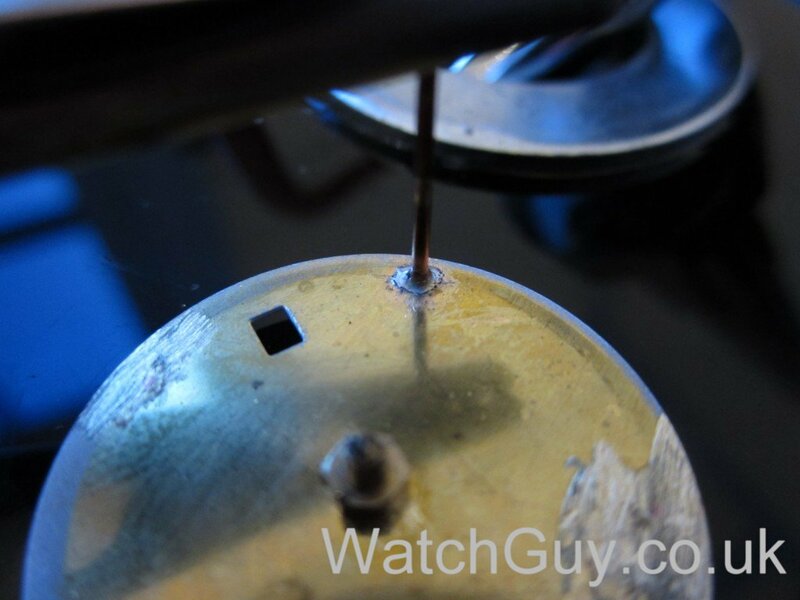 I mark the position of the dot with a cross that I scratch into the dial, so I can find the position again with the grease gone. That done, I carefully remove the grease, as grease and soldering are no friends. Having removed the grease, I scratch off the varnish that covers the dial back. 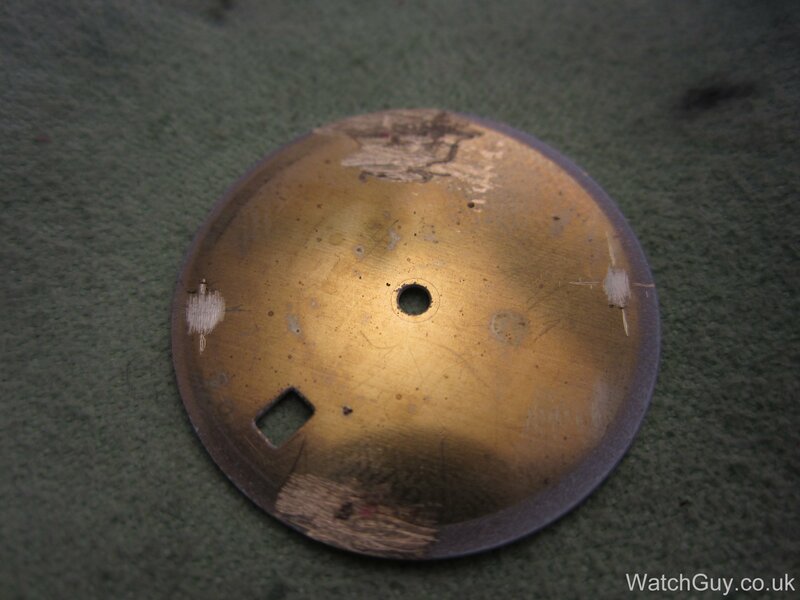 Even if your dial is not varnished, you have to create a fresh, clean surface for soldering. 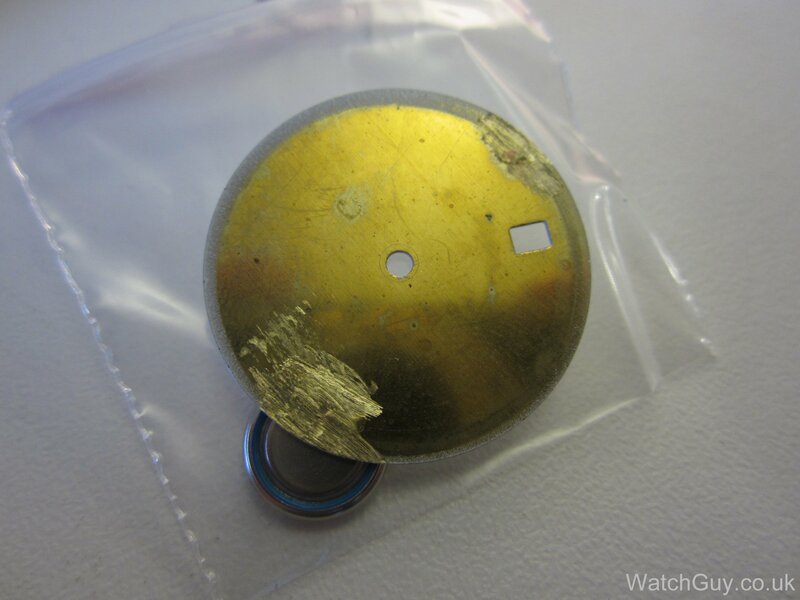 I also apply a tiny amount of flux to the dial, and then cut off the smallest possible amount of solder. 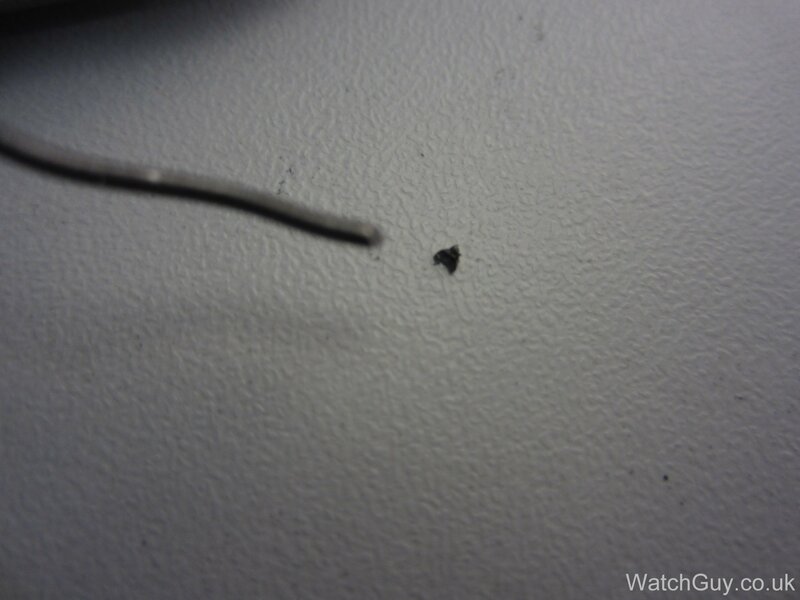 This is very thin solder for electronic work, and that’s just the right stuff. You really only want a tiny tiny amount. 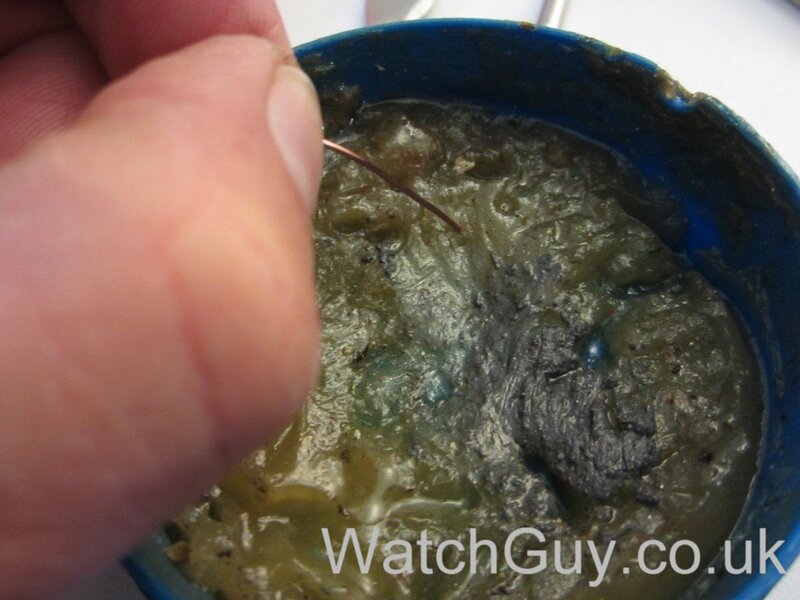 Too much, and you have too much solder riding up the foot, which makes it too thick. You fix the wire in place with the crocodile clamp, and apply current. 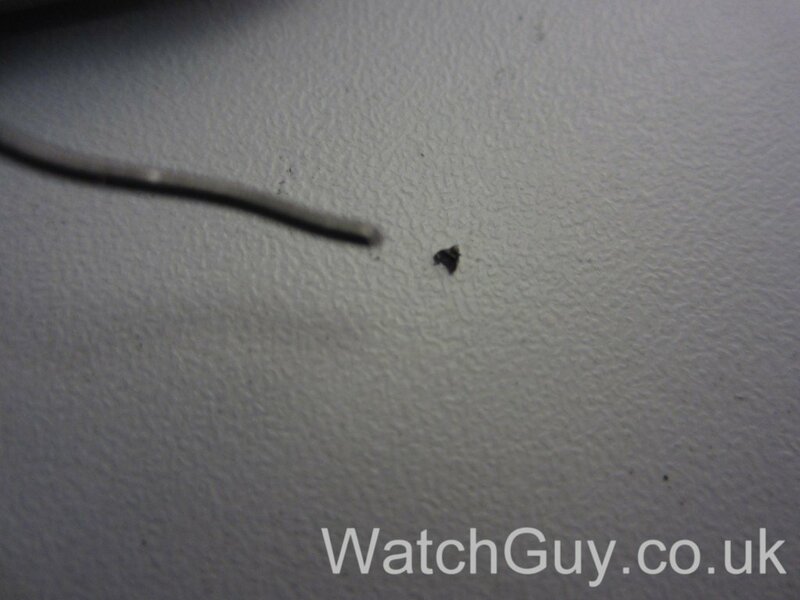 Within a second, the wire heats up, and the solder melts. Just when it starts to spread properly, stop the current, and you will have a perfect joint. With both feet attached, I cut the wire to length, and flatten it at the top, and take the burr off (not yet removed in the photo). We’re ready to roll! 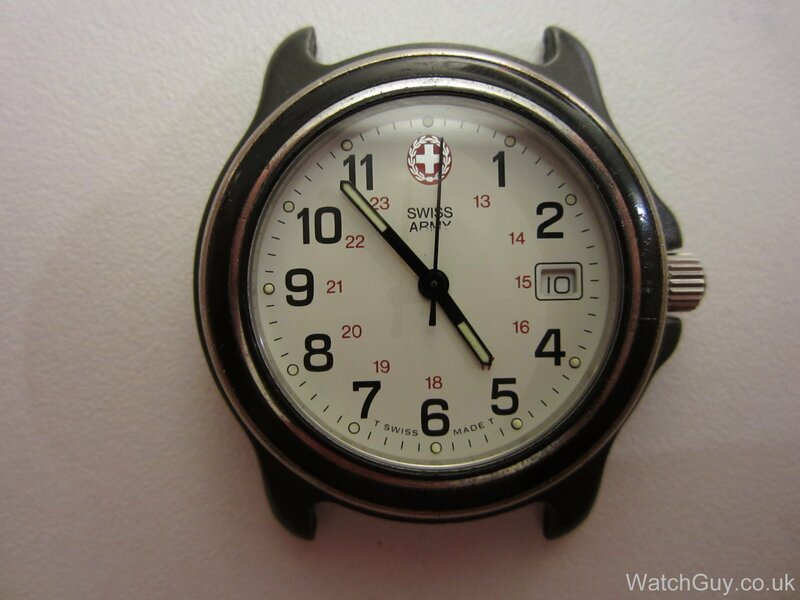 So after all, the quartz watch was worthwhile saving – it’s a quite nice looking Swiss Army watch, and Joris got it from his girlfriend 20 years ago! I had to reposition the feet once, as the dial wasn’t quite in the right position. You can re-heat the feet in the dial soldering machine, and slightly move them, so that’s feasible. Not easy, and the whole operation takes me a good hour. 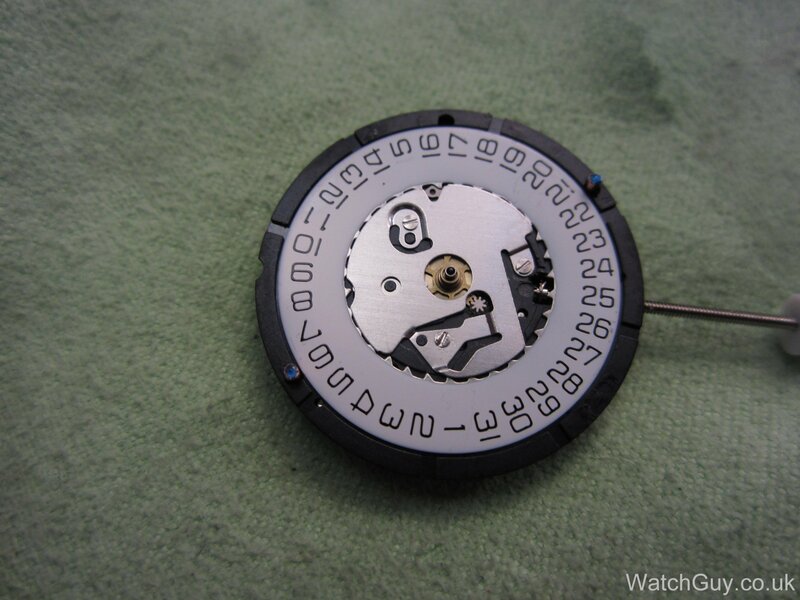 But not only did I save Joris watch, I also got some useful experience with my new dial soldering machine. This entry was posted in HowTo, Quartz by Christian. Bookmark the permalink. did you use this machine? I bought it for a very good price of $ 140, this machine is quite sophisticated design, all connectors are flexible, comes with a tin and eight bronze. It’s as fast and easy as I’ve ever seen before. I don’t sell them – try Google. Thanks for your project. Can I learn output voltage and current values of your soldering machine ? Search on ebay – that’s where I bought mine. Can I learn to your soldering machine’s properties? As always a clear and concisely written ‘how to’. Well, Cirrus, the only real solution is to have someone make you an entirely new dial. They can’t be patched, filled, overpainted. Believe me. I got caught out this way and it’s a horrible, horrible feeling. To me, this is a crime as serious as horse thieving and should be punished similarly. And as to dial feet…don’t get me started. Dial pads, I meant dial pads. Death to dial pads. Death to dial pads. Death to dial pads. Death to dial pads. Death to dial pads. Death to dial pads. Death to dial pads. Death to dial pads. I suspect filling and repainting my damaged dial would be possible, but then the repair would be exactly where you need to mount new feet. It’s a shame really as the dial is otherwise lovely. Hi Cirrus, I’m not sure about that. I sent pictures of mine to DR Bill, oft-mentioned in these parts, and they wouldn’t touch it. Same with another dial refinisher here in the UK. 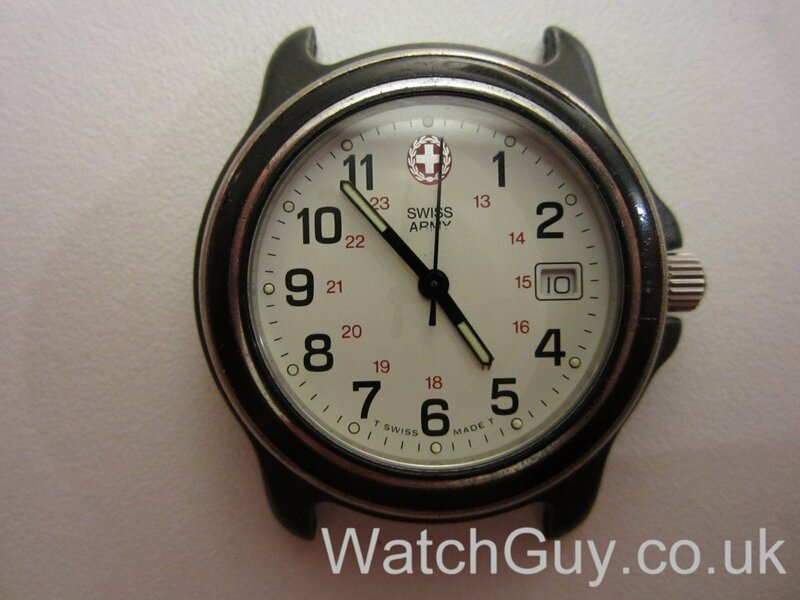 The solution was to have them make a new dial, which was surprisingly reasonably priced. 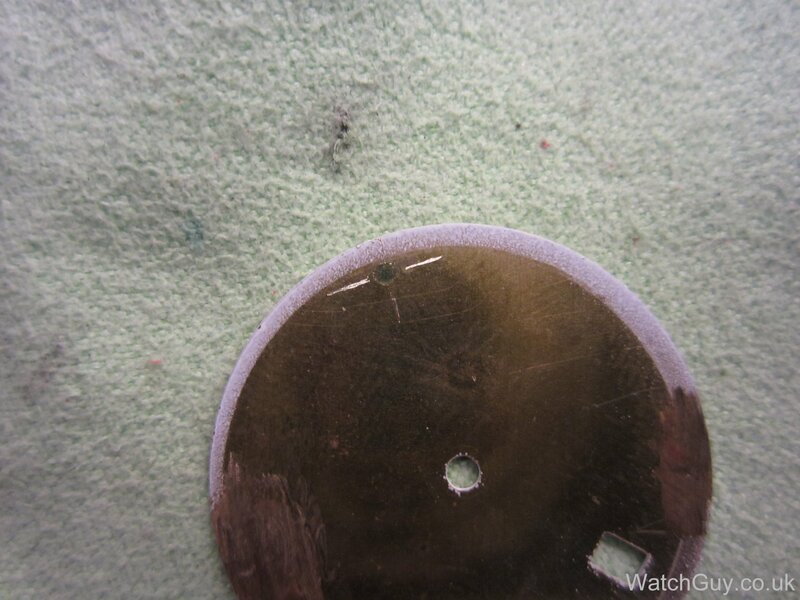 I suspect there is more flexing and settling going on across a dial face than you might suspect, and guess that an filler would soon come away; both refinishers felt that they would never be able to accomplish a surface evenly blended enough, too. So…. They pushed out the old markers and reapplied them! Glad it was them doing that and not me!